Whilst it would have been great training and no doubt a bloody good laugh, circumstances have conspired against me and I won't be able to do Hit The North. I saw some pics of the preview rides so decided to check the area out and see if I could find the singletrack sections. It's just off my commute route so tuesday I took a spin round. The drinkwater trail centre stuff is now finished, looks alright but the vegetation at the sides has grown right up, twisty stuff I was ripping down a few weeks ago is now slower due to not being able to see the route. Did some of the old HTN stuff, including one steep down with so many ferns higher than my bars I couldn't see the trail at all, well dodgy. I went up to giants seat and a bit of exploring found some of the stuff from the pics. In the pics there was the shonkiest bridge ever, I'd decided it must be the pic, nowt could be that bad - it was worse. More like a ladder than a bridge and the last couple of panels bowed scarily under my feet. Some lovely singletrack down there tho, a route down a little valley constantly crossing the stream, dips and drops and mini-bermed corners, nice. Forks bottomed out harshly a few times in the dips, properly ragging it. 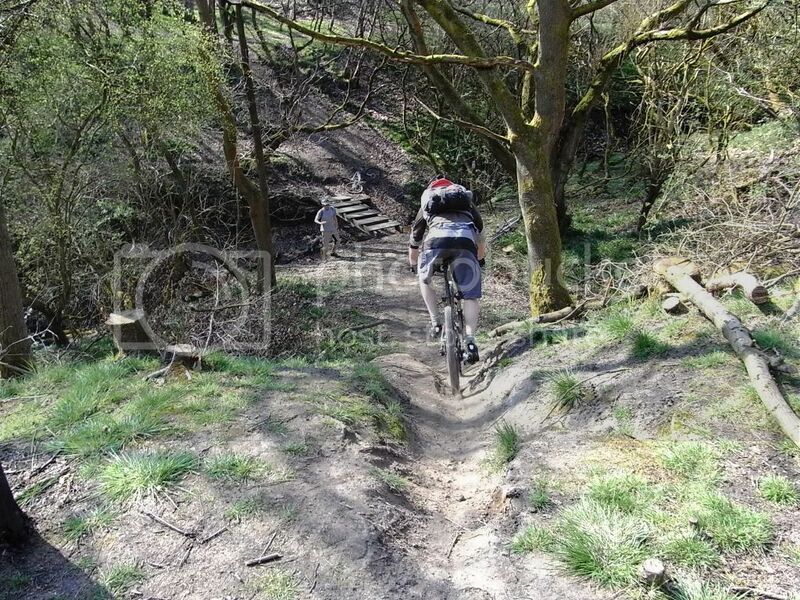 Popped out at the end onto a familiar looking trail, The Hogs Back (iirc) last time I did this was lap 8 of HTN1 and it was purgatory, unrideable, too slippy to even walk properly but now it was ACE! I ripped along it, lovely trail, bloody brilliant. Did the section near the campsite and the bombhole too then the heavens opened so I sped off home. Should ride there more often, hope HTN 2 goes well.